It's a big lifestyle change for those thinking about being a cabin crew. There will be plenty of rewards, variety and new challenges to look forward to. There will be lots of fun. You’ll never get bored. 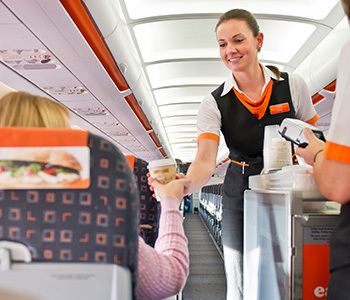 We now consider cabin crew recruitment requirements for Etihad Airways, Easyjet and Ryanair. • Confident in water and be able to swim with the aid of a flotation device.• Able to reach 210cms without shoes. • Etihad requires compliance with UAE and GCAA visa, medical and health screening requirements. At Etihad Airways, you are required to submit online your full CV and 2 photographs (full length plus passport copy). To ensure your CV and pictures are impeccable to Etihad Airways, we can help by reviewing them before your submission. Prices: Photo editing - GBP£12.50 per image; CV Review - GBP£50. Turnaround: 4-7 days. Before you submit your application on-line at Easyjet, we can assist by reviewing and updating your CV so that your transferable skills are highlighted. Prices: Photo editing - GBP£12.50 per image; CV Review - GBP£50. Turnaround: 4-7 days. At Ryanair, you must have a good level of English, both written and spoken, an EU passport and good computer skills. If you have all of this, as well as the energy and drive to throw yourself into your job with enthusiasm, then check out Ryanair's current vacancies and follow the instructions to apply. Before you do so, we suggest you get your CV reviewed by us to ensure all of your transferable skills are highlighted.